I'm not familiar with Tama Janowitz's work but I have heard of her and was keen to read this collection of biographical essays on New York. There are just so many things going on all the time in this wonderful city, so I decided to read Ms. Janowitz's take on this city. Right off the bat she relates how she bled all over the show while attending an after-the-premiere-party at the Museum of Modern Art. The great thing about this type of book, especially if you're enjoying it, is that you can read a few essays and put the book down for a while and pick it up at a later date and enjoy some more. There's no storyline to lose and it makes the book last longer. 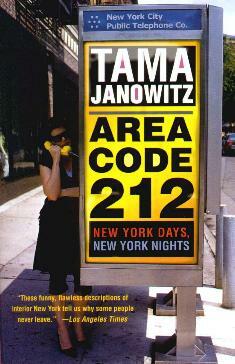 I have to say, I enjoyed Ms. Janowitz's writing, and I liked her take on life in the Big Apple. She's divided her book into parts - Family, Life, Animals, Breakthroughs in Science and Medicine, Food, and City Life. I read how she adopted her daughter in China, about the cat lady, nannies, squirrels, butterflies, eating out, single women, water, apartments, noise, and more. Most are humorous anecdotes of her life as a writer, the people she meets, and the things she does, among other things. Anyone who's spent time in this great city will appreciate her observations. Conclusion - I liked this book and am glad I left some stories for another day.